Residents in Suffolk, Nassau, and Eastern Queens, are still very concerned about cancer, healthy food choices, and mental health, according to community health data that we’ve collected and analyzed at the Long Island Health Collaborative. The Community Health Assessment Survey is a tool the Collaborative developed that collects primary data about Long Islanders’ and Eastern Queens residents’ health concerns for themselves and their communities. On Long Island, hospitals, county health departments, community-based organizations and other social and health services providers use data like this to offer programs that best meet the needs of local communities. To provide this data, the LIHC compared Community Health Assessment Survey data from January - June 2018 to data from the same time period in 2017. When survey-takers were asked about their biggest health concerns, and about the biggest health concerns in the communities where they live, cancer was among the top three answers for each of the three counties. Cancer also landed in the top three most selected answers in 2017. Many cancers are now considered chronic conditions, and require medical management over years and even decades. An increase in prevention screenings, as well as advances in pharmaceutical and treatment interventions, have made certain chronic conditions more manageable for those diagnosed. While age is considered the leading risk factor for most cancers, lifestyle habits and environmental factors also contribute to the likelihood of developing these diseases. Unhealthy diets and lack of exercise, which often lead to obesity, are modifiable risk factors. The Long Island Health Collaborative and its partners support access to affordable and nutritious foods and encourage residents of all ages to walk. Which is why we offer a free online walking program. Learn more and sign up for the Are You Ready, Feet?™ physical activity portal today. Results of the Community Health Needs Assessment survey also showed that concerns about nutrition are at the forefront of Long Islanders’ minds. When asked what is most needed to improve the health of their communities, the most often selected response was healthier food choices. Food insecurity is the state of not being able to afford and/or find nutritious food in one’s community. The number of Long Island residents experiencing food insecurity has increasingly caught the attention of public health leaders, health providers, and even health insurers, over the last few years. Access to healthy food choices is an important part of a person’s health, especially if they suffer from a chronic disease. Access to healthy food is considered a social determinant of health, one of many factors of a person’s life or environment that affect their health outcomes. To address the social determinants of health, specifically this one related to food, the Health Collaborative’s Food Access Cluster is currently focused on programs offered in one Long Island community. The Food Access Cluster is comparing the effect of these programs to health indicators for that community, such as obesity rates and consumption of fruits and vegetables, to gauge how impactful these efforts are on improving the health of residents. Other results show that Suffolk County residents are highly concerned about issues related to mental and behavioral health. Specifically, depression and suicide for both themselves and their communities were among the top five most selected answers on the CHNA Survey. There are many organizations doing important work related to mental and behavioral health on Long Island. In Suffolk County, the Association for Mental Health and Wellness is a hub of resources for residents, and the Mental Association of Nassau County provides services and information to their community. Another question on the CHNA survey asked about barriers to care. In Nassau and Eastern Queens, the top barriers to accessing medical treatment are lack of health insurance and inability to pay co-pays/deductibles. In Suffolk, lack of health insurance remains the most selected response. The insurance findings, consistent with earlier analyses, warrant further investigation, since New York’s health insurance marketplace has greatly expanded access to affordable health insurance. Regarding health screenings and education/information services, in the Nassau and Eastern Queens, blood pressure, cancer, and cholesterol screenings/information remain in the top five. Specifically, information related to diabetes and exercise/physical activity entered the top five at positions three and five, respectively. In Suffolk, information/education related to drug and alcohol services was the most selected response. In the previous analysis, it was not in the top five. The Community Health Assessment Survey is just one data component that paints a picture of the health of residents on Long Island and Eastern Queens. 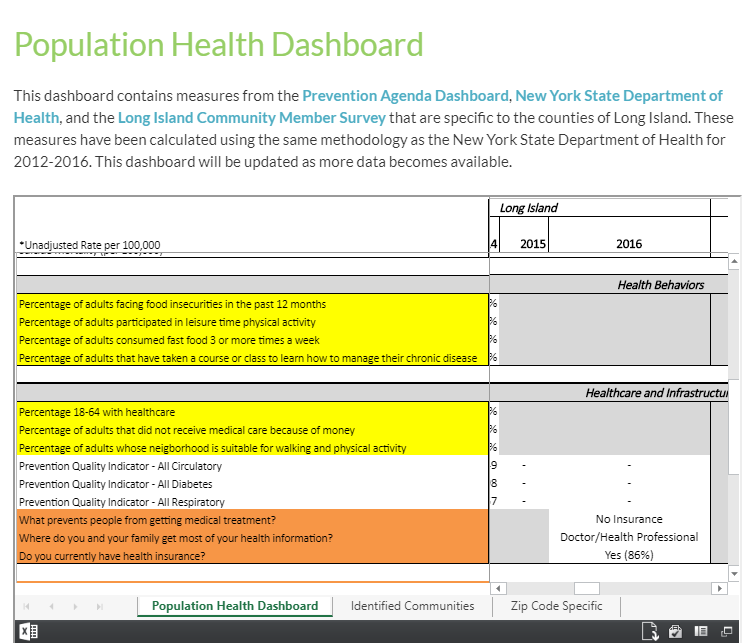 It is part of the Population Health Dashboard, developed and powered by the Long Island Health Collaborative. The dashboard is a unique web-based tool that displays data by state, county, and zip code. The dashboard displays primary data collected and analyzed by the Long Island Health Collaborative, along with comparisons of data sets housed by the New York State Department of Health. The Community Health Assessment Survey is a primary data source which delves into residents’ perceptions about their healthcare needs, barriers to accessing health care, insurance coverage, and more. Analyses are conducted bi-annually. In 2017, the eastern Queens region was added. (Individuals are encouraged to complete the online survey.) Secondary datasets look at food availability, hospitalizations, physical activity levels, and obesity rates, among many other data points. The dashboard is updated as new data becomes available. The dashboard is an excellent resource for researchers, grant writers, physicians and anyone involved in providing healthcare and social services, but residents can also get a sense of the burden of disease on their communities. Patients play a key role in ensuring their own good health by adopting healthy behaviors and adhering to treatment plans. A healthier community leads to a more robust local economic infrastructure and prosperity. Health is the undervalued connector. Do you agree with these opinions? Take the Community Health Assessment Survey to tell your local health organizations about your community. Or view results from previous years, visit the Population Health Dashboard to see what your community has expressed concern about in the past, and how it related to other data collected by New York State. See what other healthy services are available. Organizations across Long Island offer resources to keep your and your family happy and healthy.